It was my honor to deliver the following message to the OWS community tonight on behalf of WOW (Women Occupying Wall Street). The statement was drafted to express our collective outrage at being blatantly disrespected and sidelined during Friday night's Spokes Council meeting. Unfortunately, the chaotic nature of tonight's GA further illustrated the urgency of re-committing to the principles of solidarity and mutual respect outlined in this document. It will be read again during tomorrow night's Spokes Council. At last Friday's Spokes Council, the Women Occupying Wall Street (WOW) Spoke stepped up to the mic to present our application to the Spokes Council inclusion. Almost immediately, our Spoke was interrupted by a male member of the community who physically seized the microphone. Derailing process, he argued that the facilitation team's decision to go forward with the meeting violated the principle of "transparent participatory democracy" enshrined in our Principles of Solidarity. Regardless of the contested validity of Friday's Spokes Council, WOW’s right to speak was egregiously disrespected, violating an equally important Principle of solidarity: "mutual respect." Without mutual respect, our movement will be held hostage by those who violate process. Yielding to those that push the hardest and shout the loudest is the culture of the Wall Street trading floors we are purportedly united in fighting. It is the culture that justifies the use of violence, fear and coercion to wield power over the 99%. The silencing of WOW reflects a broader failure in our movement to recognize and meaningfully address privilege. 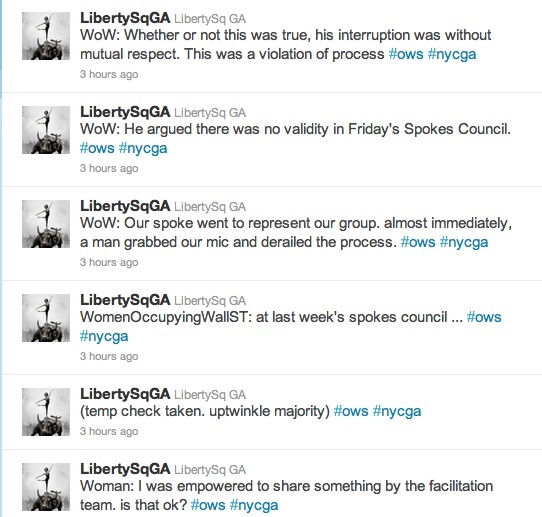 Thus far, Spokes Council has failed utterly in "empowering one another against oppression." It is imperative that we take "individual and collective responsibility" to devise concrete actions that address this failure. The Spokes Council was not a safe space on Friday night, and without safe space, we cannot fully and fairly participate in direct democratic process. To ensure that marginalized voices can be heard, we must uphold the principles of solidarity that this community has agreed upon. WOW calls on the OWS community to commit to one foundational practice: listening with mutual respect and without interruption to those who have been empowered by the community to speak. Through active listening and respect for each other and our mutually agreed upon process of communication, we must work together to create a community in which all voices are truly equal. *This is a living document that is currently being reviewed and collaboratively edited by the members of WOW.